In reverence and celebration of children everywhere—especially the ones who live secretly inside all of us—this piece is an observation of, and a tribute to, the unalloyed joy of innocence and the purity of the child. It also reflects the tenderness of the unconditional love of a parent. The breathtaking fragility of the first statement of the main theme perfectly sums up the fragility of a child’s innocence. 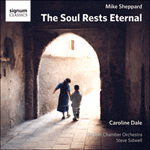 The central section unveils a second, more robust and joyful theme that builds to a full orchestra tutti with strings, horns and cello all combining in a full-voiced rendition of the main subject, before a sudden return to the first theme. A new theme is introduced in the Coda, featuring an exquisitely beautifully played horn solo. This is echoed by a solo clarinet before the piece ends with a return to the codetta of the first theme.